Bashundhara Kings roped in domestic football super-star Emon Mahmud Babu for their upcoming Bangladesh Premiere League (BPL) 2018-2019 campaign. 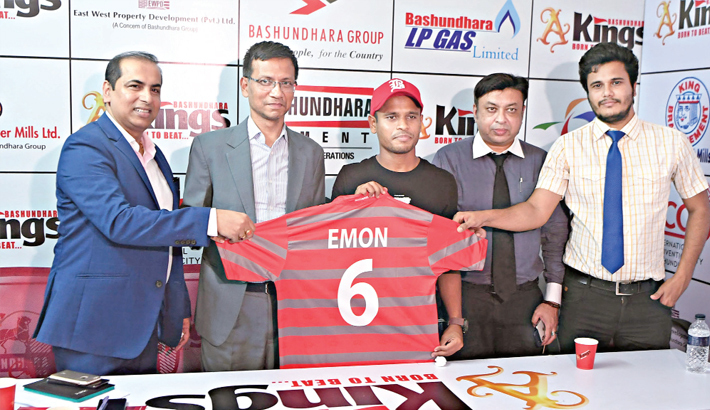 Emon signed the official contract with Kings during an agreement signing ceremony at Bashundhara Kings Headquarters in Bashundhara Residential Area on Monday. Bashundhara Kings President Imrul Hasan and General Secretary Minhajul Islam Minhaj represented the club in the contract signing ceremony yesterday. Kings have already created a stir in the domestic football circuit by recruiting some of the best national players along with a sensational foreign core. Emon Babu also felt that the plans and the efforts undertaken by Bashundhara Kings are very exciting and he is very pleased to be part of Kings’ squad. “Bashundhara Kings have some really good plans and that’s the reason I decided to join them despite being part of Abahani. I hope that I will be able to be of use to Bashundhara Kings,” said Emon. Bashundhara Kings President Imrul Hassan was very straight-forward as he revealed that Emon Babu was part of their plan since they were promoted in Bangladesh Premier League (BPL). “Emon Babu was the architect of Dhaka Abahani’s success in the recent editions of BPL. We have been closely following his development. We basically assembled the whole team keeping Emon in mind,” said Hassan. Imrul Hassan also stated that Kings will bring in some more star players in their already heavyweight squad. “Apart from the domestic players we have already signed, we are in talks with several other players. They might also be from the champion team too,” said Imrul. Moreover, Bashundhara Kings also signed in two fresh faces recently, Bishal Das and Awlad. Bishal Das played for Brothers Union in BPL 2018. He is Bangladesh-born Spanish while Awlad has played in a club of Netherlands’ fourth division. The club officials hoped that Kings will bring a fresh competition in the BPL tournament and will be a force to reckon with in the future. Earlier, Kings sources confirmed that Mamun Ali, who played for Farashganj Sporting Club Ltd and Sohanur Rahman, former player of Chittagong Abahani Ltd, will be wearing Kings’ jersey in this season of BPL football. Bashundhara Kings also roped in Mannaf Rabby, Krishna Kumar, Shoaib, Rakibul Hasan Tushar, Hemonto Vincent Biswas, Didarul Haque, Salahuddin, Towhidul Alam Sabuj, Nurul Nayeem Faisal and Mohammad Ibrahim for their maiden stint in the premier league of the country. Meanwhile, Bashundhara Kings will test their strength against New Radiant Sports Club of Maldives in a friendly match at Bashundhara Kings’ home venue Sheikh Kamal Stadium in Nilphamari on September 21. New Radiant have agreed to visit Bangladesh following an invitation from Bashundhara Kings. According to club sources, Bashundhara Kings intend to sharpen their edge with the encounter against New Radiant. The sub-continental football powerhouse, New Radiant, have taken huge strides in continental tournaments in recent years. New Radiant will land in Bangladesh on September 18. After taking part in the friendly match against Bashundhara Kings on September 21, they fly back to Maldives on September 22.